What do the tadpoles of little brown frogs eat? We’re very pleased to be able to share some results from our amphibian captive breeding program with you this month. The full article can be found here. A juvenile Mantidactylus betsileanus frog from the study. Published in the journal Alytes, our members worked together to investigate what is the best diet for the tadpoles of the Madagascar Betsileo Frog Mantidactylus betsileanus. We found a locally available shrimp and powdered spirulina aglae to work better for rearing the tadpoles than mustard greens. A tadpole in the study just about ready to complete metamorphosis. Although the frog is not highly threatened, the information gained will help us develop future ex situ conservation programmes for species at risk that we have yet to learn how to keep in captivity. Perhaps just as importantly, the study helped our team of five amphibian technicians develop scientific expertise, and being able to answer biological questions using the scientific method allows us to make informed management decisions, not just about frogs but about the environment as a whole. Terrariums at the breeding facility that house the frogs. Can paying for ecosystem services reduce poverty in Madagascar? This is the question the P4GES Project hopes to answer through their three year research initiative involving scientists from the UK, Madagascar, the Netherlands, and Switzerland. 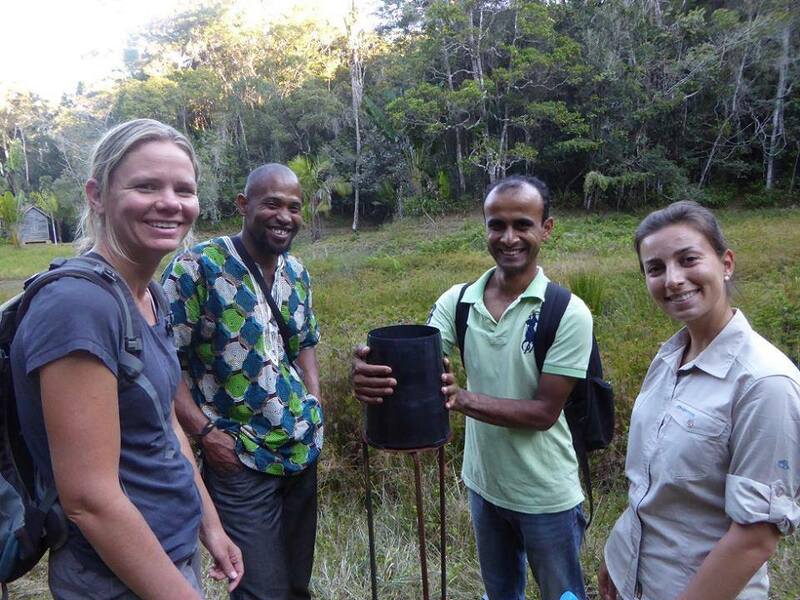 Mitsinjo’s President Jean Noel Ndriamiary with a P4GES research team conducting an infiltration experiment in degraded vegetation west of Analamazaotra Forest. 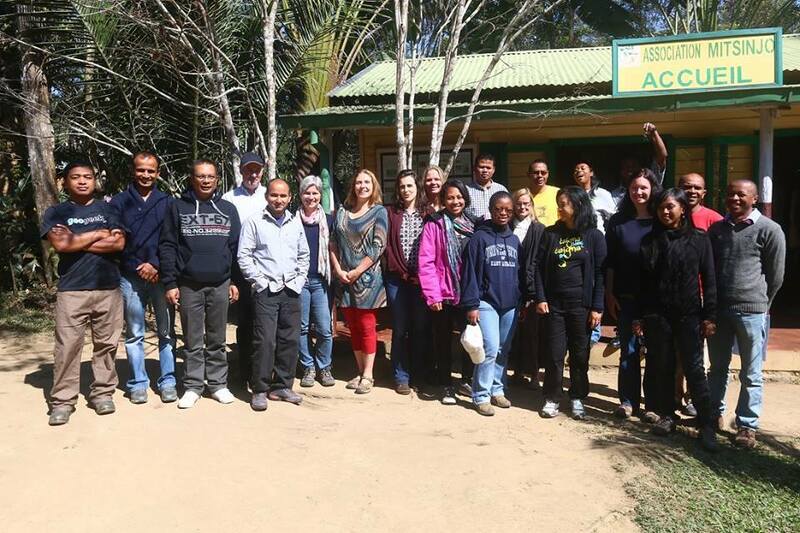 We were pleased to be able to host their recent workshop in Andasibe September 16-18. The various research teams were able to meet at our office and share some of their work conducted so far, not only among each other but also with Mitsinjo’s collaborative staff. P4GES Hydrology team demonstrating their closed canopy weather station in Mitsinjo forest. 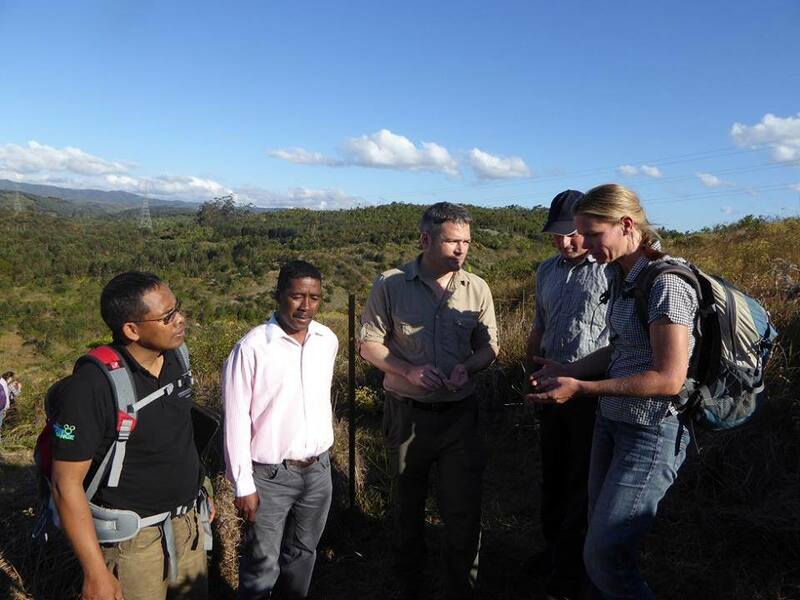 Although the workshop for P4GES took place in Andasibe, the project’s focal area is the entire Ankeniheny-Zahamena Forest Corridor (CAZ). The project is supported by ESPA, a research initiative that provides support to investigate how ecosystems function and their benefit to communities in developing countries. What secretive creatures live in Mitsinjo’s forests that we have not yet found? World famous geneticists Tom Gilbert and Kristine Bohmann from the University of Copenhagen / Copenhagen Zoo came to Mitsinjo in 2012 and 2013 to do just this. It was the first site in Madagascar to test their innovative approach for producing evidence for the occurrence of very rare and elusive animals by using the DNA in the blood of leeches. Ubiquitous in Malagasy rainforests, leeches are perfect ambush predators with a preference for vertebrate blood. Cashed blood can be retrieved from the leeches’ crops and tested for vertebrate DNA. The DNA in the blood of leeches could help identify rare and hard-to-find wildlife in Madagascar’s forests. Using leeches, Tom Gilbert and his colleagues were able to identify the DNA of very rare and elusive mammals in Vietnam such as Chinese Ferret-badger Melogale moschata and the Annamite Stripped Rabbit Nesolagus timminsi. These are difficult to detect and identify with either camera trapping or other conventional methods. National Geographic have recently joined highlighted their extraordinary work. 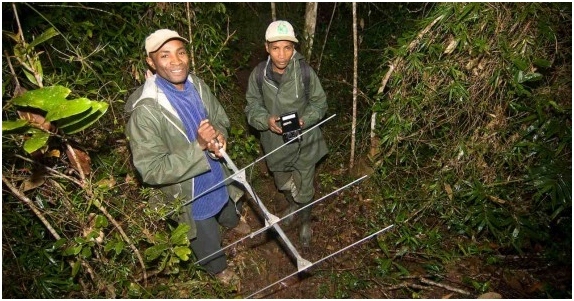 In 2012 and 2013, they tested if this methodology can be a useful tool for tracking down rare any elusive animals in the Malagasy rainforests as well. We especially hope that this method could shed light both on the assemblage of carnivores and the occurrence of critically endangered species such as the Greater Bamboo Lemur Prolemur simus or indeed other rare lemur species. 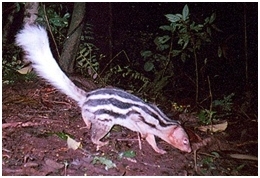 Does the Broad-striped Mongoose (Galidictis fasciata) exist in Andasibe? Leeches may help to answer this. 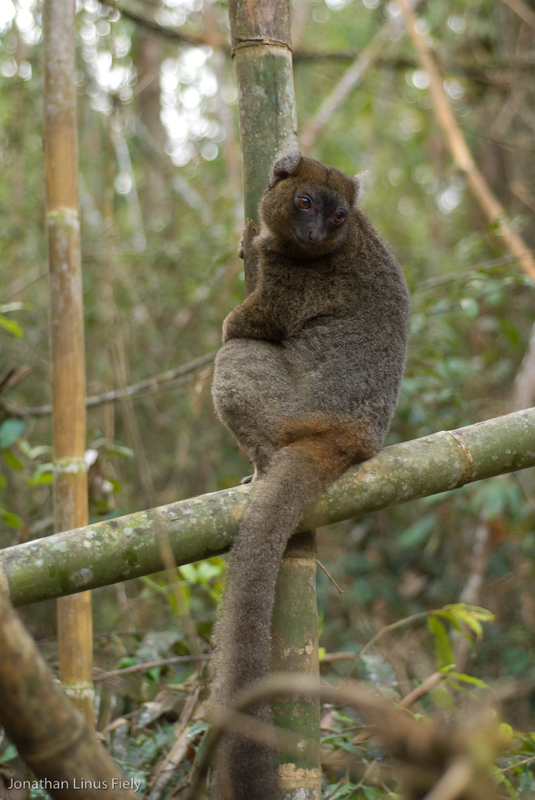 Mitsinjo has received accounts by villagers of Broad-striped Mongoose Galidictis fasciata in the forests around Andasibe, but no confirmed sightings have ever been recorded. Perhaps this exciting new research might bring an answer to the mystery.